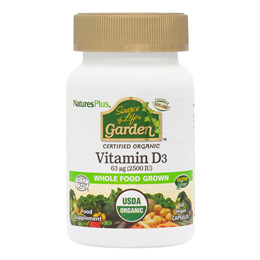 Source of Life Garden Vitamin D3 Caps with Certified Organic Nutrients provides 63 mcg per serving of cholecalciferol from a variety of organic mushrooms. Certified Organic Whole Food Blend (Bulking Agent [Rice Maltodextrin], Rice Protein, Acerola Extract, Cayenne Pepper, Broccoli Sprout, Cauliflower Sprout, Garlic, Cordyceps Mushroom Mycelia [Cordyceps sinensis], Ginger Root, Kale Sprout, Maitake Mushroom Mycelia, Lemon Peel, Parsley, Pure Beet Juice, Pure Carrot Juice, Pure Spirulina, Turmeric Root, Shiitake Mushroom Mycelia, Spinach, Tomato Juice, Wild Bilberry, Wild Blueberry, Pure Chlorella), Certified Organic Mushroom Blend, Capsule (Pullulan Polysaccharides [from Aureobasidium pullulans]). 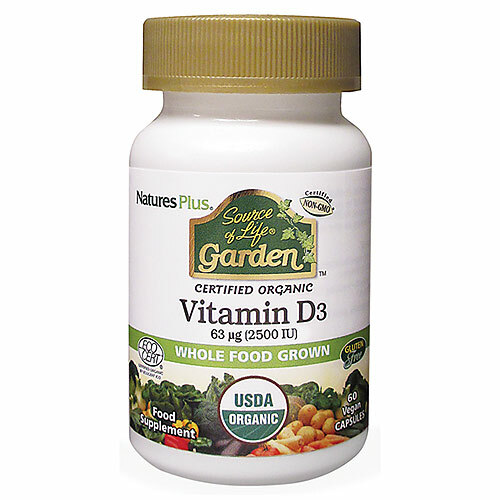 Below are reviews of Source of Life Garden Organic Vit D3 - 60 x 2500iu Capsules by bodykind customers. If you have tried this product we'd love to hear what you think so please leave a review.